Anyone who knows my husband well has heard stories of his love of McDonald’s McGriddle. Or maybe you’ve seen him in action scarfing down two of the sits-like-a-rock-in-your-stomach breakfast sandwiches. Though he’s as caveman as it gets (in more ways than paleo! 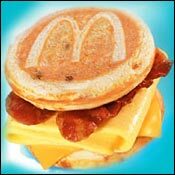 ), his one true weakness (besides me, of course) is the McGriddle. I’m convinced Ronald laces it with something in addition to saturated fat and high fructose corn syrup, though that might just be enough to have the general population hooked. For the past few weeks, James has persistently requested I make a paleo-inspired version of the McGriddle. It’s definitely not rocket science, so the proportions can be tweaked as needed or as your tastebuds prefer. 2. Blend two eggs, almond meal, cottage cheese and vanilla. A couple years ago, I bought James two of these special blender cups, thinking that’d he’d mainly use them for protein shakes. But we also use them for pancakes and green drink. It attaches directly to your blender blade, so it’s easy to make single servings. In case you’re interested, I got them at Bed, Bath & Beyond. 3. Pour on pre-heated griddle (roughly 225 to 250 degrees), and flip once bubbles appear. 4. Puncture the top of four pancakes with a fork and spread a spoonful of maple syrup on the top of each. 5. Then lay bacon on top of two pancakes. 6. Make a three-egg omelette using remaining eggs and cream. Be sure to generously coat your pan with oil so it doesn’t stick. because he’s an expert and because I’m afraid I’ll ruin it if I flip it. I tried to catch him mid-flip, but was too slow. 7. Add shredded cheese, fold over omelette and halve. 8. Place halves atop bacon and add remaining maple-soaked pancakes on top. Next time, we’re trying sausage McGriddles!